By 1896, large-scale land enclosure in Chilean Tierra del Fuego was well-advanced. 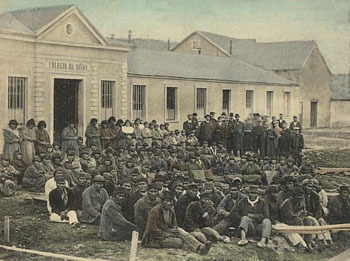 Most of the indigenous Ona people had lost their freedom of movement, and were being forcibly relocated to the Salesian mission on Dawson Island, in the Strait of Magellan. Governor Manuel Señoret shows notable faith in the adaptability of the native peoples to modern civilization, given the appropriate incentives and stimuli. Deeply critical of the missionaries, whose efforts are judged to be useless and a waste of human lives, he recommends (too late) ways to avoid forcible displacement.